The F5 was a significant technological tour de force from Nikon in 1996. It broke new ground in many areas, one of which was speed. A key aspect of the camera’s performance was the reduction of mirror bounce, which resulted in decreased blackout time. Nikon F5 was the first SLR from Nikon to use the mirror balancer, which is now standard on all high performance Nikon SLRs, including the D3. The best description of the mirror balancer I have found is at the Nikon D Technology site, where a flash movie shows how the mirror balancer operates. As to how effective the mirror balancer is, this can be seen from a slow motion video of the D3, posted recently on Youtube. Another interesting perspective on the D3 mirror and shutter timing can be obtained from a sequence put together by Marianne Oelund, turned into a web movie by Jeffrey Friedl. The D3 has a 37 millisecond shutter lag, and 74 millisecond blackout. To achieve this level of speed must take extremely high precision and performance. Information regarding the D3 sequencing is not available, but we can learn something from its ancestor, the F5. 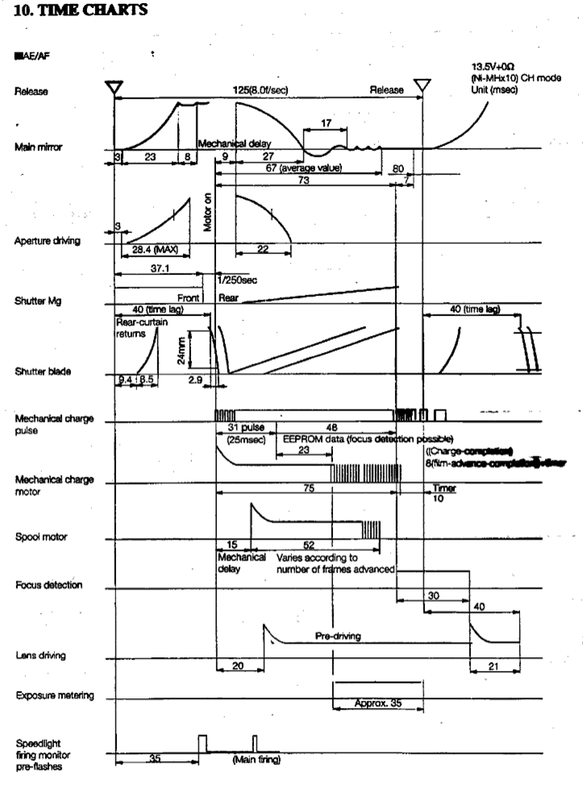 Here is a page from the F5 repair manual, which depicts the camera’s sequencing. From above, we can see that the F5 shutter lag is about 40 milliseconds. The time it takes for the shutter curtains to travel is 2.9 milliseconds. I am not quite sure how the viewfinder blackout time is calculated, but it seems that if we count from the time of release, then the mirror is down and stable in about 93 milliseconds, though it another 10 milliseconds for it to be completely stable. Interestingly, metering starts earlier, but focus detection can only start when the mirror is completely stable. Perhaps this explains why Canon’s attempt to get AF working at 10 fps is proving to be a challenge. Nikon's literature on D4 is reticent about changes if any to the mirror balancer used. However since the maximum speed has been upped to 10 fps it is possible that some optimisations have been made. One clue is the US patent US20100189428 that discloses a mechanism whereby the secondary mirror is stabilised independently of the main mirror. The following table shows the shutter lag and viewfinder blackout times of various Nikon SLRs. The information for digital SLRs was obtained from Nikon’s published brochures. It is harder to get information about film cameras.